Trellis week! 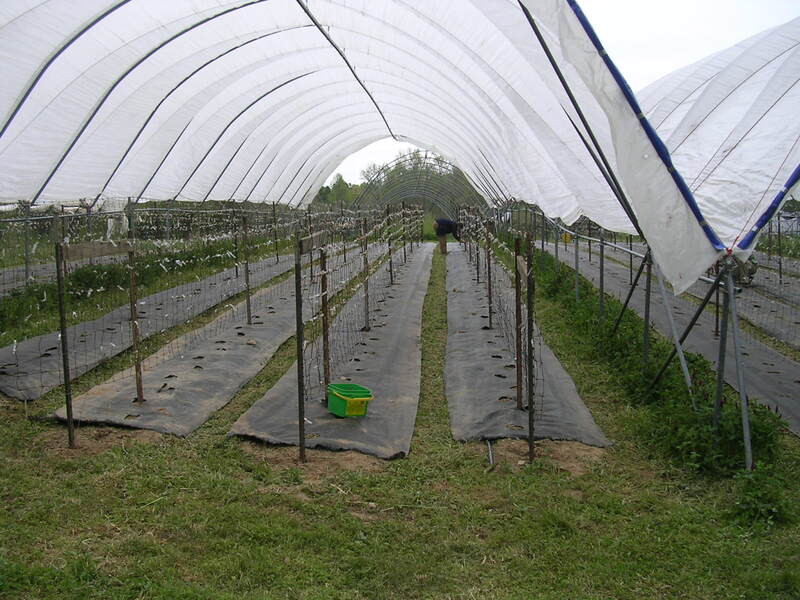 Over the years we have become semi-famous for our different systems to hold plants up for better utilization of space, more and cleaner fruit or long straight flower stems. I have even done workshops at farming conferences on the subject. For many horticultural crops it is a critical part of the production system but it also has labor and material costs that need to be scrutinized to be worth the effort. Trellises need to be both fast to put up and fast to take down, including all the plant material that has grown up through the structure. Some small tools are ubiquitous on all small farms- rakes and hoes, seed flats, hoses, 5 gallon buckets. I used to say that 5 gallon buckets were the backbone of market gardens but for us it is the lowly metal T-post which is designed for livestock fencing but we have adopted for fast and sturdy plant support. We have used them for blackberry and raspberry trellises, for tomatoes, peppers, peas, cucumbers, sunflowers, celosia and all manner of other cut flowers and yes we have even built deer fence with them. We now have hundreds of them in 5, 6 and 8 foot lengths. 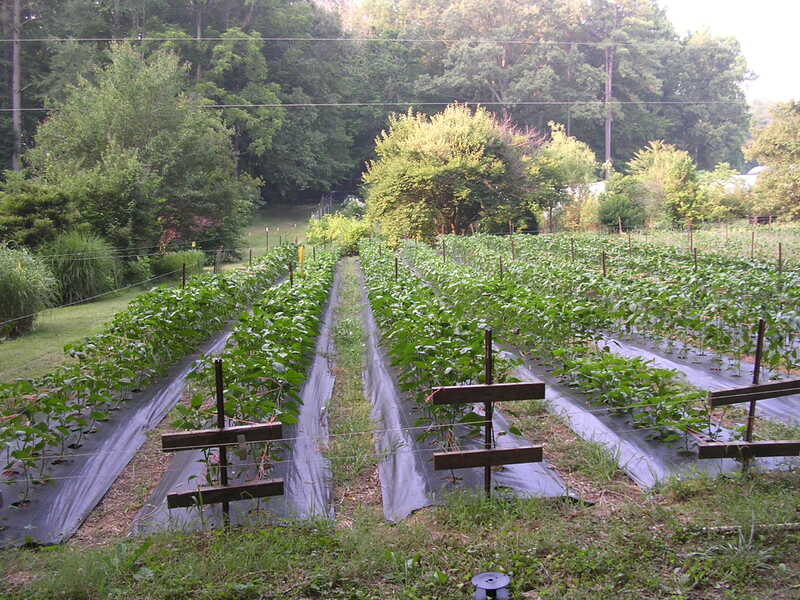 All of our trellises start with the driving of the posts into the soil about a foot deep and then various cross arms, wires, netting or fencing is hung off or attached to the posts. In past years we would, annually, put in at least 600 posts and then pull them back out at the end of the season. That was a lot of work but we would have 2-3 people working on it and it happened throughout the season. Another sign of the more manageable Peregrine Farm is that we pounded essentially all of the posts for the year this week and it was less than 80 and there are only two more trellises to come with 16 additional posts. Checking off those big tasks one by one. This is the time of year that we are always tieing something up. Many of the summer crops need “assistance” standing up, so over the years we have developed multiple ways to trellis them. Trellising takes extra time and labor so we only do it for certain crops that really need it. Tomatoes, peppers, cucumbers and pole beans in the vegetables along with lisianthus, sunflowers, celosia, delphinium and a few others in the flowers. Besides making it easier to harvest them because they are up off the ground it also gives us better quality. Straight flower stems with clean blooms are Betsy’s goal, those S shaped sunflower stems may look cool but most folks won’t buy them. In the vegetables it also give us nice clean fruit but also allows for good airflow around the plants so they dry out faster in the mornings after a rain or heavy dew. Most of the diseases that affect these crops are a fungus or a bacteria, warm wet conditions are perfect for them to go wild. If we can get those plants up into the breeze then we can slow down the inevitable spread of these diseases. So we have come up with a set of trellis designs that can be put up fast, do the job and then come down just as fast. I am the king of metal T-posts, electric fence wire, a few pieces of 2X4, baling twine and some kind of mesh either plastic or metal. Sounds just like a farmer, a job is not worth doing if it doesn’t involve some electric fence wire, baling twine and maybe some duct tape. Early in the year the staff is gradually trained in how to build the various “styles”. 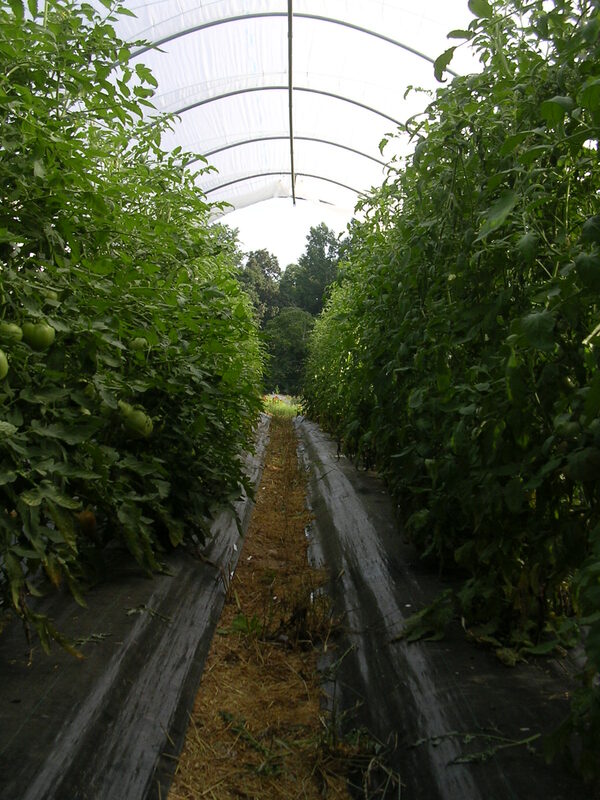 Heavy duty tomato trellis with metal fencing hanging off of six foot T-posts, strong enough to bear the weight of nearly 1000 pounds of fruit and vine per 100 foot long row. Then the wispy pea fences of plastic mesh hanging off the same post set up, just enough structure for them to grab onto with their tendrils and light hollow stems. Soon they move to the graduate courses in trellising, horizontal structures that float over the rows on cross arms attached to… metal T-posts. First the plastic flower netting placed just above the growing and budding plants so the weight of just the heavy blooms are supported as they grow up through it. Finally the two and three level condos of trellises, the pepper array. A lower level of baling twine run on either side of the little ten inch tall plants to keep them upright in the summer storms. Then another layer eighteen inches above that of wires and baling twine to catch the branches as they grow up through it to support the weight of the growing fruit, really tall peppers like poblanos get a third, pent house layer at almost four feet above ground. Cov and Elizabeth are now certified trellis technicians, with almost 6000 feet of construction behind them. This week the last 500 feet of tomato trellis and the first layer on the pepper trellis. A friend once said my tombstone would read “He was an OK farmer but he sure could tie things up”.